At some point, push comes to shove. We have been navigating the health insurance market since 1995. We have found ourselves searching for options since 2014. Rates have more than doubled since then. It's unsustainable and the law basically forced all the health plans into the same expensive box (if you don't get a tax credit). We finally feel like we have an option to show people which we can get behind. What is Aliera Healthcare, Inc.
How long has Aliera Healthcare, Inc and Trinity Healthshare been in business? We can generally get the 1st of the following month. Learn about their popular catastrophic health sharing plan called CarePlus Advantage here. Lots to cover. Lots to save! In the ACA law (Obamacare), there was a small piece that gave certain non-profit companies, Health Care Sharing Ministries, the ability to offer plans to people that are not ACA compliant. These were generally religiously affiliated or based on a set of beliefs. The entities had to be in existence before 1999. Only six companies met the requirements. Aliera Healthcare, Inc is an administrator for one of them. The entity they partnered with, Trinity Healthshare, LLC has actually been helping people cover health care costs for years. Trinity HealthShare handles the big ticket items (hospital, etc) while Aliera handles the first dollar benefits (preventative, office consult, etc). 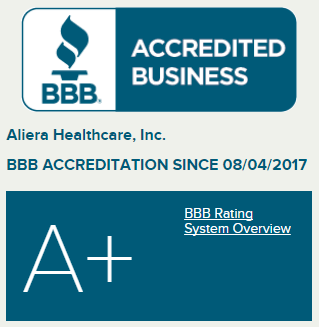 Aliera Healthcare, Inc. has been in business since 2011. The net net to you...Health care sharing ministry plans like AlieraCare plans allow you to essentially buy plans similar to the old benefits! The plans before the ACA law. In California, actually back to 1999 in some respects. You can see the difference between Covered Ca and health care sharing ministry here. One note...Health care sharing ministry plans are NOT insurance. When we say the "old plans" the new health care sharing ministry plans work similarly to them but are not insurance. There are some very important differences to understand. Make sure to read "What AlieraCare plans are NOT" below. Must Read! We'll cover the pros and cons of these health care sharing ministry plans versus insurance later. The plans are guaranteed issue with waiting periods for pre-existing conditions. Health care sharing ministry plans aren't for everyone. Make sure to check out the section below on who health care sharing ministry plans works best for. So...that's health care sharing ministry plans with broad strokes. What about AlieraCare plans specifically? What is Aliera Healthcare, Inc? 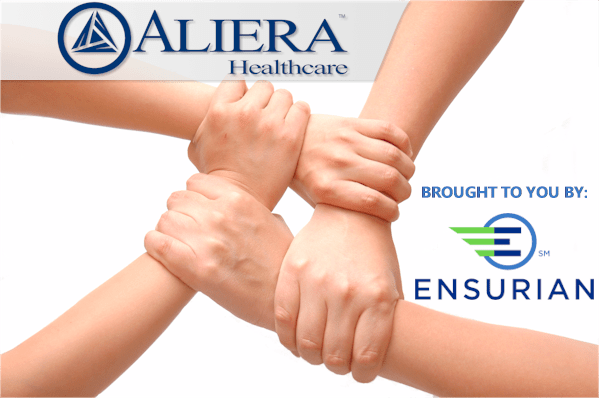 Aliera Healthcare, Inc. is the administrator for Trinity HealthShare - one of the six companies that were accredited as Health Sharing entities under the ACA law. In terms of doctors, AlieraCare plans use the PHCS PPO network. This is one of the largest PPO nationwide networks with almost 1M providers included. Your health plan is only as good as the doctors it allows you to see. We're seeing lots of issues with that on the ACA health plans as they continue to narrow their networks. The PHCS (provider search here) is a great asset for AlieraCare plans. We really want people to understand their options. In doing so, we have to explain the downsides as well as the upsides of the AlieraCare plans (or health care sharing ministry plans in general) plans. If an agent or company doesn't make this next bit clear, run don't walk. We like AlieraCare plans for SOME clients (see below for who AlieraCare plans works for) but they have to understand the differences. I understand that Aliera Healthcare, Inc (which administers for a health sharing ministry) is NOT insurance nor does it provide insurance coverage. It is not intended to be a replacement of comprehensive health coverage found through the Federal or State exchange. Trinity HealthShare, is a health care sharing ministry. Eligible needs are shared by the members according to the membership guidelines. This membership is not a legal binding agreement and does not guarantee or promise that your eligible needs will be shared by the membership. It makes no assumption of risks. If sharing is not possible, you will remain financially liable for unpaid medical bills. The financial assistance members receive come from other member's monthly contributions that are placed in an escrow account, not from Trinity HealthShare. Aliera Healthcare, Inc. does NOT fall under the oversight of the Department of Insurance (DOI). There is no DOI protection or backstop in case the company goes bankrupt, expenses are not paid, or payment is denied. 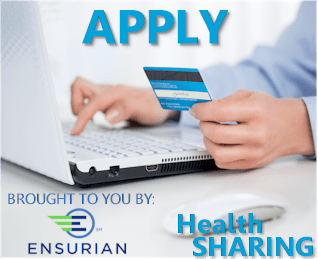 Individuals who choose to enroll in a health care sharing ministry plan receive a waiver from the individual tax penalty.. There is a 24-month pre-existing condition exclusion for hospitalization in which the membership does not share on any hospital needs for any condition you've been treated for, received medical advice for, taken prescriptions for or had any surgery for in the past 24 months prior to joining the membership. This plan covers hospital expenses incurred by you and eligible members when you have an emergency room visit or has extended into a hospital stay for conditions not related to prior pre-existing conditions. If the ER is used for a non-emergency situation then the expenses may not be covered. All members are required to activate their accounts prior to using the membership. Aliera Healthcare, Inc. does not cover Mental Health benefits except on specific plans. Aliera Healthcare, Inc. is not required to cover the Essential Health Benefits under the ACA law. By law, Aliera Healthcare, Inc. does undergo an audit annually by an independent accounting firm to ensure financial stability. 20% of monthly membership dues are is held in reserves for paying eligible expenses. Link to Member's Guide here. There are many pros to AlieraCare plans..primarily the cost. For some people without a tax credit, it may be the only option they can afford. We're not doing our job though unless we help people understand the differences between it and ACA health plans. Keep in mind that we are ultimately covering till we get to the next Open Enrollment or a Special Enrollment trigger. All we can say is this...if you're comparing health care sharing ministries, we strongly recommend going with the safest among them. In our calculation, it's Aliera Healthcare, Inc.
We have had ZERO issues and we're one of the bigger enrollers. How long has Aliera healthcare, Inc. and Trinity healthshare been in business? For many people seeking healthcare offerings, Aliera Healthcare, Inc. and Trinity Healthshare may be new. This is less and less so with each rate increase on the Obamacare market. Aliera Healthcare, Inc. has been in existence since 2011. They handle the first dollar expenses such as preventative, office consults, labs, etc. Trinity Healthshare has been in existence for over 60 years. They handle the bigger ticket items such as hospital, surgery, ER, etc. Broadest plan options and backend protection for big bills. Keeps 20% of monthly dues for eligible expense payment reserve - Very Important! Aliera Healthcare, Inc. has a relaxed eligibility requirement compared to other options. There are no secular or non-religious health care sharing plans by design, but Aliera Healthcare, Inc. is definitely the most pragmatic. 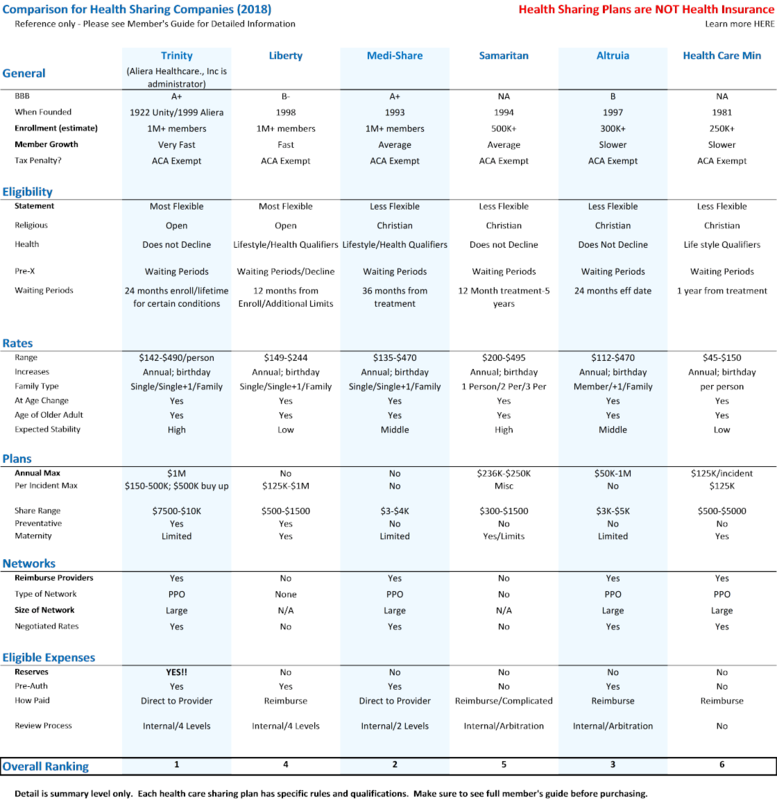 We have a comprehensive guide to comparing the main health care sharing ministries. Look. We're very conservative in terms of options to address health care needs. We've seen lots of options come and go on the health market that agents loved because they were great for agents. We ran from those because there were serious issues for the members if they had really large bills. What's the point of a plan if it doesn't protect from the big bill. We really had to feel confident about AlieraCare plans to recommend them to our clients...some of which we have had since 1995! There's a lot of trust there and Aliera Healthcare, Inc. meets our lofty requirements for certain clients. Make sure to read the "Who are AlieraCare plans good for" section as it's not for everyone. Aliera Healthcare, Inc. goes the farthest in protecting people from the big bills that are all too common in today's health care world. We've studied all the health care sharing ministries and Aliera Healthcare, Inc. stands out as the best in our view. As licensed health agents and appointed AlieraCare plan agents, we're happy to walk through your situation to see if it's a good fit. With AlieraCare plans or ACA health plans. AlieraCare plans are another option that's going to fit very well for a segment of the population. As part of their exemption from the ACA requirements (especially the penalty! ), health care sharing ministries have to use different terminology from traditional insurance. Keep in mind that AlieraCare plans are NOT health insurance. One note...with AlieraCare plans, the MSRA is also the same as the traditional insurance max out of pocket. It's all one number which is a clean way to do it. There isn't a percentage share between the two. One less thing we would have to rename! You'll see on the brochure the statement "This is NOT Insurance"
See above for what AlieraCare plans are not. Very helpful and important to understand the difference before making any decision. A pool of people that all share eligible medical expenses together. Just an FYI but that's similar to how insurance works. Make sure to see the AlieraCare plan acknowledgement above to understand how this differs to you. We'll cover the few items that are important to understand in the "Who are AlieraCare Plan for" section but we feel really good about AlieraCare's plan options (especially the Premium plan) for protection. This is one of the items that really sets AlieraCare plans apart from the other health sharing companies. They have access to the PCHS PPO network of providers nationwide! Run your AlieraCare plan provider search here. Keep in mind that the individual/family ACA networks available now are about 1/3rd the size of the group networks (through employer) or the old grandfathered networks. This has been the biggest issue since 2014. The networks seem to be only shrinking with every year. More of the ACA plans are moving to EPO's and HMO's as well. Having a PPO available through AlieraCare is a huge deal. Also, since it's a PPO network, we get the negotiated PPO rates in-network for eligible expenses. That's generally a savings of 30-60% on average even before we meet our Member Share of Responsibility Amount (MSRA - similar to Deductible). We've seen discounts even higher for labs and hospital care. It's a big deal and we get it with the large PCHS PPO network nationwide. First, if you're not eligible for a tax credit, you've seen the price double to triple since 2014. Even on the high deductible Bronze plan. At renewal, people are throwing in the towel. It's either an option like AlieraCare plans or no health plan. The pricing for AlieraCare plans can be an affordable option. On the flip side, you don't want to get hit with the tax penalty of 2.5% of income. You also don't want to get hit with a major health insurance bill. 60% of bankruptcies are due to unforseen health issues. For healthy people with no tax credit, AlieraCare plans may be the only option. You have to able to afford the monthly cost. A large percentage of our ACA members lapse coverage due to an inability to pay the monthly premium. Even people with tax credits! That explains why health care sharing plans are doing so well. The second part deals specifically with Aliera Healthcare, Inc.
Aliera Healthcare, Inc. is by far our favorite of the health care sharing ministries. 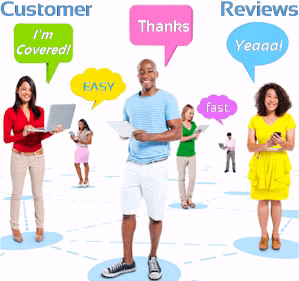 We've talked about why AlieraCare plans is the best but it comes down to this. They have the most relaxed statement of beliefs and qualifications. They are open to more people than the others! That alone makes them the choice for many people! You can quote them here to look rates, plans, even the online application. Who do AlieraCare Plans work best for? AlieraCare plans are not for everyone. Let's first say who it probably isn't a good fit for. Basically, most of this comes down to two points. If you can get cheaper coverage on the ACA marketplace (due to tax credit), that's the way to go. Most of you do not have that option and therefore, you're investigating AlieraCare plans here. Remember when we said AlieraCare plans were like the health plans we had before the ACA law? Aliera Healthcare, Inc. doesn't decline people based on health but there will be waiting periods for pre-x conditions. This means that the carrier will not pay out for expenses related pre-existing conditions for a period of time depending on the plan. There are also waiting periods for specific services until you've been on the plan for a while. Maternity for example might have a 10 month waiting period. You can see the plan benefits here or the AlieraCare plan brochure here and the Member's Guide here. Another big point...Aliera Healthcare, Inc. does not cover mental health benefits except on certain plans. We need to understand this and it's in our Acknowledgement we require from enrollees. This is to protect our clients and make sure they understand their options. Net net...if you expect more serious health issues or have more serious pre-existing conditions, AlieraCare plans might not be the right fit. We can help you compare AlieraCare plans and the ACA plans (quote here) for your situation. There's no cost for our assistance as Certified Covered Ca agents and licensed AlieraCare plan specialist. Call 800-320-6269 or email us. So...who Are AlieraCare Plans good for? The health care sharing plans do not cover mental healthcare except for specific plans. This would include psychotropic medications for mental health. One note...keep in mind that we can switch to ACA plans that address some of these holes at Open Enrollment of each year or if you have a SEP (major life change such as losing eligible health, marriage, birth, or move that affects options). This really gives us a 12 month window worse case after which we can switch to an ACA plan if need be. We have a full comparison of the AlieraCare health sharing plans including InterimCare, CarePlus, Standard Plan, and Comprehensive plans here. 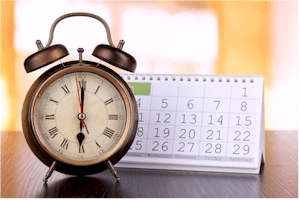 When can you enroll in AlieraCare plans? There's no open enrollment with AlieraCare plans. Many people call outside of either period and they're stuck. We've had short term coverage in 3 month blocks but that's not great. 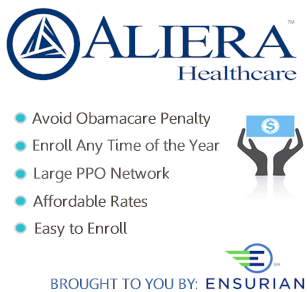 Aliera Healthcare, Inc. is a much better fit for people who missed open enrollment. AlieraCare plans are also guaranteed issue. They don't decline based on health. Instead, they do it the old way where waiting periods for pre-existing conditions and certain new ones (maternity after 10 months etc) are imposed. This is still better than Short term which also has pre-x conditions and can decline based on health. It's Free. Online. And Fast. Everything is online and secure. Please let us know if you have any questions on the application. We're here to help at 800-320-6269 or by email. AlieraCare is our go-to option for people who can't enroll in Obamacare plans now. Keep in mind that we're very conservative with our clients. We have been helping people for almost 30 years now as INDEPENDENT, licensed agents. We're also Certified Covered California agents. Our interest is our client's. We have clients that have been with us since 1995. We break it down this way. Health care sharing plans allow us to go back in time. To plan design similar to what we had before Obamacare. Secondly, of the health care sharing ministries (there are 6), Trinity Healthshare (which Aliera Healthcare, Inc. administers for) is the most reasonable, similar to health insurance, and sophisticated. They also don't decline people or have very strict requirements on eligibility like the other health care sharing ministries. Furthermore, we don't like the fact that the others exclude more people for other reasons than health. That doesn't feel very American to us. That's why we like AlieraCare plans as an option where it makes sense. Get more detail on Obamacare health coverage versus Health Sharing. We're happy to help you compare the two. Our assistance is 100% free to you. The rates available through us is identical for either AlieraCare or Obamacare. You can get more information on why AlieraCare plans are our favorite health care sharing option. You can always get the full benefit summary via the quote below or access the brochure here. We're also here to help with any questions. But let's give you a quick synopsis. Make sure to check out the "health care sharing terminology" above so that you understand the different way to say things (versus insurance). AlieraCare standard plans are the most comprehensive of Aliera Healthcare, Inc.'s options that aren't ACA compliant. Basically, you have a choice of 9 options. The MSRA is pretty straight forward. The MSRA is your responsibility. There is no percentage paid after that amount before you meet a cap. It's all one number for covered events in a calendar year. This is where the plans change a bit. We really like the premium. It's closest to what people expect in their plans. The main thing we look for the is the per incident max payout which jumps to $500K on the premium. This is huge to us and makes us feel a lot better about what we're recommending for our clients. All three options have a lifetime max of $1M. Keep in mind that we can always change to ACA plans at year end worst case but $1M is what we had before the ACA. Take a look at the benefit benefits via the quote or the brochure. We're here to help with any other questions! The rates can be affordable compared to full ACA plans. That's only growing wider as the ACA plans go up each year at double digit rates. 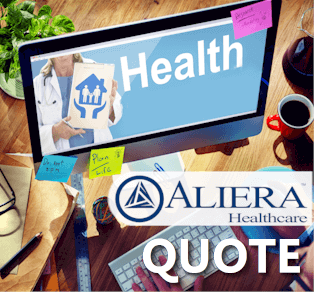 You can run your own quote here for AlieraCare plans and here for Obamacare. 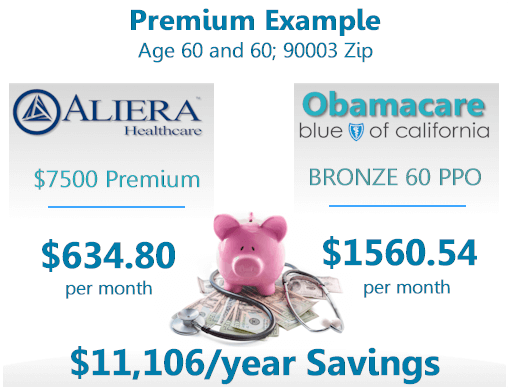 Compare the Bronze rates to Aliera Healthcare, Inc.'s Premium plan with the $7500 deductible. Keep in mind that AlieraCare plans are not insurance. We are licensed and appointed agents with Aliera Healthcare, Inc. and Trinity Healthshare. The rates are identical through us! We've had 1000's of clients since 1995 and we're busier than ever. Roughly 1/3rd of our clients are referrals even with a crazy web presence. If you do not receive a tax credit and you're in good health and you can't afford Obamacare or being uninsured? AlieraCare health share plans have to be in the mix. We do not jump quickly or lightly into new healthcare options. Look to see if any other agent or website fully explains the trade-offs of health sharing plans the way we did. It took us some time to really get behind this option after researching and studying it. "I can't afford this (Obamacare plan) anymore"
We're getting those calls too often these days. AlieraCare health share plans are our go-to option for those people and more. We're happy to run a quote for you to see how it compares for your situation. We'll quickly see if health sharing plans like AlieraCare might be a good fit for you.